Have you noticed our new office at The Shoppes at CreekSide? We are located just west of the crossroads in Cashiers, North Carolina. CreekSide is one of the premier new retail developments in Cashiers and soon to be a landmark in our little mountain escape. Are you looking for a home, townhome, condo, or land in Cashiers, Sapphire, Highlands?Our new, easy to usecustom MLS searchsoftware -- My Property Manager -- canhelpyou find the right property quickly. Youcan save and edit your favorite searches and receiveautomatic updates via email when a new matching property becomes available. Whether you are looking for awaterfront homeon Lake Glenville or Lake Toxaway, a country club home at Cullasaja Club,Wildcat Cliffs, or Highlands Cove, or a mountaintop getaway with long range views, ournew MLSsearch can help.My Property Manager isjust one of thepersonalized services we offer at Silver Creek Real Estate Group to help you find the perfect property.Start your own searches today through our website at www.ncliving.com. Should you have any questions please feel free to email Jochen Lucke at jlucke@ncliving.com. When the North Carolina Association of Realtors wanted to interview a Realtor with over 30 years experience and find out what insight they may have, they called Elaine Zachary withSilver Creek Real Estate Group. Elaine pointed out that her "best tactic in this market revolves around great customer service that always puts the client first." This attitude, combined with resources and professionalism, sets us apart from other companies and brokers. For further information about the great people at Silver Creek Real Estate Group, feel free to contact Jochen Lucke at jlucke@ncliving.com or call 828-743-1999. Are you looking for a map of Cashiers or Highlands, NC? Have you ever gotten lost on the way someone's home in the area and wished you had a street map? We can help! We have free maps available at our office, so please feel free to stop by and pick one up. If you would like one before you get to town, please email me at jlucke@ncliving.com or call the office at 828-743-1999 and we'll mail one to you. On January 27, 2009, the Sapphire Valley Master Association (SVMA) purchased Red Bird Golf Course. Included in the purchase were about 30 acres of land, the pro shop building, carts, and other maintenance equipment. The SVMA also owns the Sapphire Recreation Center, the Sapphire Community Center, and the ski area. The association refinanced their existing debt and purchased the golf course with a new note in the amount of $3,153,853. According to the president of the SVMA, Mr. Walt Green, the association will save approximately $6,500 per month because of favorable interest rates. 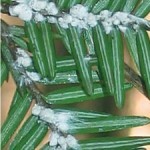 Many of you are familiar with the devastating effects of the Hemlock Woolly Adelgid (HWA) on the beautiful hemlock trees in our area. According to the US Forest Service, these pests will kill a hemlock tree within a few years. The HWA does not have enough natural enemies here to keep it in check, and the hemlock trees have not built up a resistance to it. The good news is that there are effective insecticidal treatments for infected trees, as well as preventative measures that can be taken to protect healthy trees. The Jackson-Macon Conservation Alliance (JMCA) provides helpful tips on how to treat against the HWA and save our properties and forests from this invasive and destructive insect. Visit the JMCA website at http://www.j-mca.org/hemlock.asp. Are you planning a visit to the Cashiers/Highlands area? Whether you are coming just to sightsee or plan to take advantage of opportunities in the real estate market, let us help you reserve your accommodations. We have special arrangements with some of the area's best resorts for discounted room rates and packages. Please call our office at (828) 743-1999 or email us at info@ncliving.com for more information. The ABC Store (state-run liquor store) has signed a lease for a new location in the Highlands Plaza. The new store will be located between the State Farm Insurance office and Subway. The store is scheduled to open later this spring. The current location will be part of a five-year plan for the Town Hall to expand its operations. Please check back often for more local news in the greater Cashiers and Highlands area. A snow covered Cashiers Valley.